I have a new way of looking at food. I’m sick of labeling cookies as “bad” and carrots as “good”. I just want food to be food. Carrots to be carrots. And cookies to be cookies. Also, I am never going “sugar-free” again. It just doesn’t work for me. I already eat almost entirely sugar-free and I don’t want to entirely cut out the little sugar I do eat. And they are not labeled as anything, they’re just cookies. Preheat oven to 350°F. Combine all ingredients in mixing bowl, starting with dry then adding wet. Last, add chocolate shavings, if desired. Drop dough onto cookie sheet. The cookies don’t change much while baking, so flatten them into desired cookie shapes. 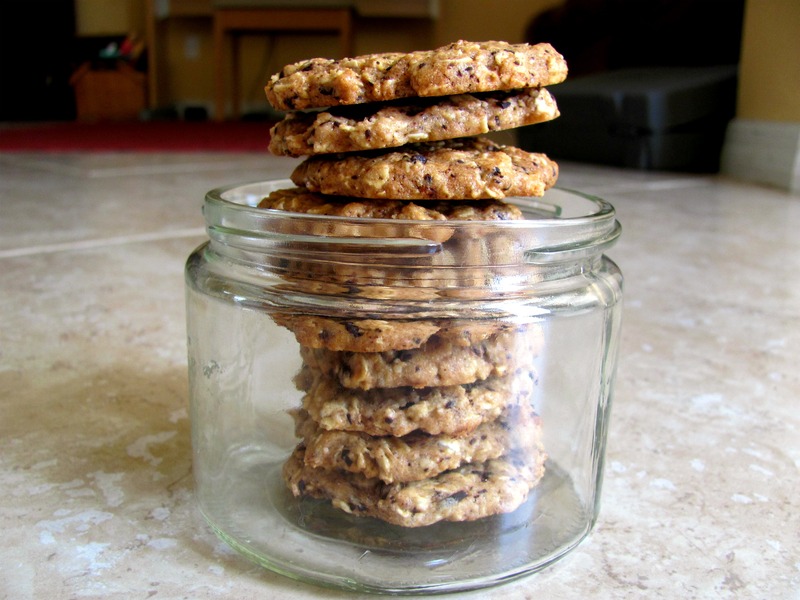 If you make them thin, you will have wonderful crunchy cookies (like mine) or you can make them a little thicker. Yum. Bake for 10-11 minutes, or until bottoms are slightly browned. Two cookies were devoured as a result of this photo shoot. Seriously, I come up with the best ideas. Cookies in a jar? Genius. I love when people figure out what works for them 🙂 I’m so glad you found what makes you happy!!!! And those cookies look really chewy and tasty! Excellant post girl 🙂 glad you are figuering out what works for you. These cookies look incredible! I’m a sucker for anything with peanut butter and oats, so these are total perfection in my book!! great job with those cookies! I wish I had one!!! Those look so good! I totally agree with you about labels.. seriously we don’t need em! It really is all about moderation. My wife and I love to indulge and cook fancy food for guests. They always think you eat like this all the time? Of course we don’t! I love this recipe and besides oatmeal’s good for you. I too have been trying to not label foods. I think it can seriously play games with your mind and it causes me too binge on “bad” foods when I do that. Everything is ok in moderation and even better when we healthify recipes! Haha, I know! I do that, too. Sweet potatoes and carrots are too high in carbs + sugar and blah blah blah, I just need to STOP. I loved the shaved chocolate in these! They’re probably even better than chocolate chips and it’s more distributed throughout. You’ve successfully combined three of my favorite cookies in one- yumm!!! Love the new food philosophy Kayla! SO positive and true! And I agree about going sugar free…the little added sugar I eat in my diet is no big deal so I don’t think there is any reason for me to go COMPLETELY sugar free! I love your attitude. It’s okay to incoporate a little bit of sugar into a healthy diet, especially something like agave or molasses which actually had some benefits! It’s also great that you are seeing food as what it is, not as good or bad. I love love love it!!! 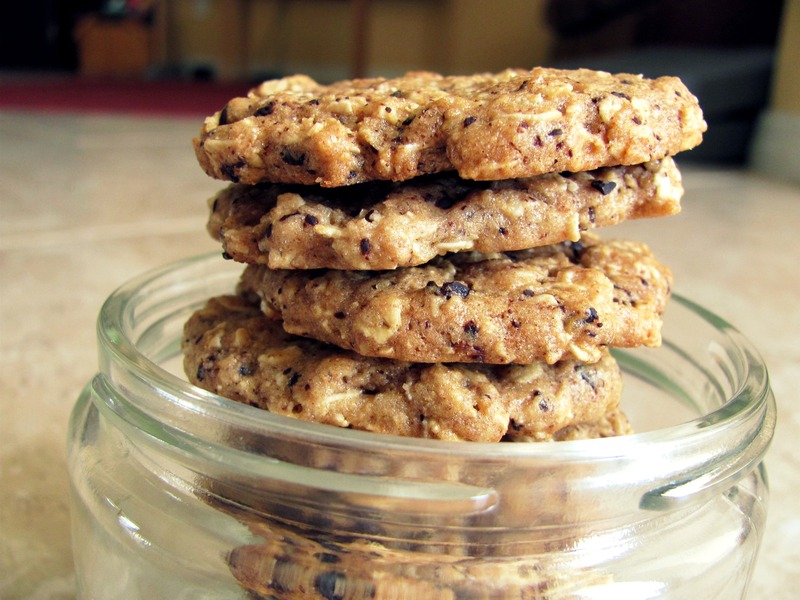 I also love love love cookies loaded with yummy fats and whole grains like this one. Om nom nom! These look DIVINE. I love chocolate chip oatmeal cookies, and the addition of nut butter is always a good thing 😀 I def. agree that labeling food is pretty useless… food is food and you should enjoy whatever you want, whether it be a cookie or a carrot. I def. know that I could never go sugar-free, nor would I ever want to. The cookies in a jar is a fantastic idea. They look so good to begin with. I definitely think that not “labeling” foods is a really good idea. Food is food and we should enjoy every bite! Peanut butter cookies are the stuff of heaven! So good, cant really go wrong with them! These look great! Another recipe of yours I will be trying 🙂 And, I agree about the sugar-free thing, I’ve come to pretty much the same conclusion. It was a good experiment though! Also that’s great about your new outlook on eating. It’s so much better to not overcomplicate things and to just eat what you want! Bravo! I, too, have been working on the labeling food as “good” or “bad” thing. I bought myself some treats yesterday, and I have already mowed my way through part of ’em. It’s so liberating to just eat, and eat foods I enjoy! I love my ‘healthy’ food, but no longer shall I deny myself some soy cheese nachos with black olives and mustard :). Ummmm…..those look so good! I want some 😀 I need some time to bake, then I will definitely be making these! What a cute idea for the pics! This recipe looks awesome! I love your new philosophy! It’s so hard to get over the labeling, but I think it is important. 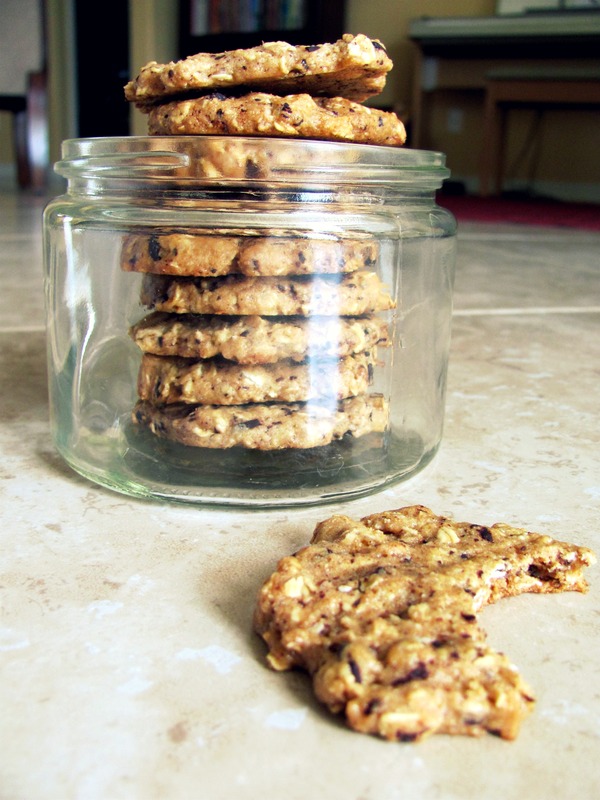 Peanut butter and Oatmeal are my two favorite kinds of cookies…sounds like I need to try these! These look great, my favorite kind of cookie! Glad you figuring out what works for you 🙂 I tend to eat lower sugar also but cutting out is just no fun, so I completely understand where your coming from. Food IS food, I agree! Sometimes I want carrots, sometimes I want cookies–they’re both GOOD. And these look particularly amazing, I love oats and peanut butter together! These cookies look so delicious! 🙂 I’m enjoying your blog. These pictures of yours are georgous!!! Wow, these are my next cookies to make! They look great, and so does the list of ingredients (I love peanut butter & agave)! The pictures are awesome too. Has a peanut butter cookie ever looked more classy? These look great! How many grams is 1 square of Baker’s unsweetened chocolate? I’m really diggin’ these cookies, girl. And cookies in a jar? Good work. YUM! My 2 favorite combinations right now! !